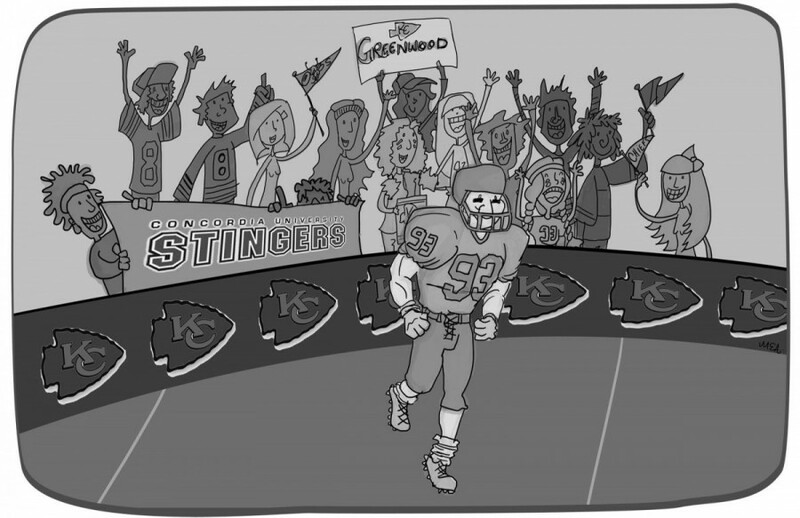 Training camp with the Kansas City Chiefs may have featured hot temperatures and been labeled a “grind” for former Concordia Stingers linebacker Cory Greenwood, but waiting to find out if he had actually sparked a National Football League team’s interest was just as stressful. Greenwood thought he would be joining the Toronto Argonauts of the Canadian Football League after the team selected him third overall in the 2010 draft. But a short time later the Kingston, Ont. native signed a one-year NFL deal and was in Kansas City challenging for a spot on the Chiefs’ 53-man active roster. The signing made Greenwood the second Stinger in 2010 to reach an agreement with an NFL team after offensive tackle Kristian Matte landed a deal with the Houston Texans weeks before. Stingers head coach Gerry McGrath could see that Greenwood had the potential to be a dominant linebacker when then-assistant coaches Ray Gagnon and Warren Craney had scouted the Regiopolis-Notre Dame Catholic High School grad. One of the things Greenwood realized about training sessions in the NFL was that they lasted much longer than those of the Canadian Interuniversity Sport football league. Training camp itself was held over a five-week period in comparison to the CIS’s two, and nine hours of Greenwood’s day was dedicated to football, rather than four. In addition to coping with the augmented level of intensity, Greenwood initially struggled with adjusting to playing according to NFL rules. Chiefs teammates Mike Vrabel and Corey Mays made Greenwood feel all the more welcome. “If I had any questions, his locker is right next to mine back in Kansas City,” said Greenwood of Mays. Greenwood, who was awarded the 2009 Presidents’ Trophy as CIS’s most outstanding defensive player, said he feels he made his first big impression on the Chiefs’ coaching staff in Kansas City’s preseason games against the Philadelphia Eagles and Green Bay Packers. Greenwood considers his tackle on the Cleveland Browns’ Joshua Cribbs as one of the highlights of his season and he ended the 2010 campaign with 11 tackles, including 10 solos. He also helped the Chiefs finish first in the AFC West division standings—a far cry from the team’s 4-12 record posted a year earlier. The former Stinger is currently considered an “exclusive rights” free agent and hopes to re-sign with the Chiefs next year. This article originally appeared in The Link Volume 31, Issue 21, published February 1, 2011.